In a saucepan, bring the broth to a simmer. Heat oil and butter in a large saucepan Saute the garlic and onion until lightly caramelized. Add the rice, salt and pepper and sauté for 2-3 minutes, stirring continually. Add the broth a 1/2 cup at a time, stirring continuously, and waiting until the liquid is absorbed before each addition. When you are about half way through the broth, add the broccoli to the rice. Continue to add broth and stir. 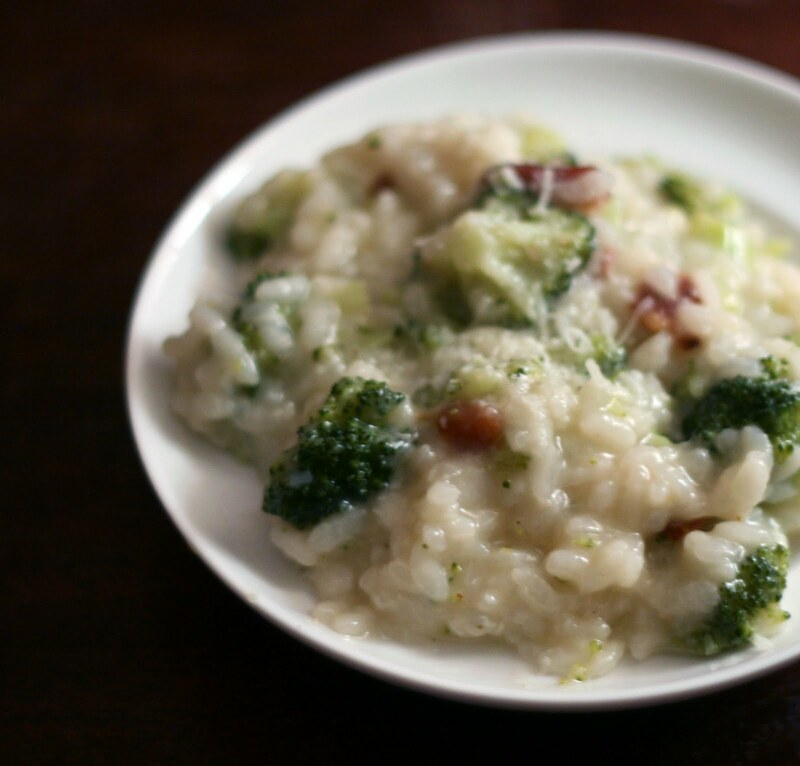 When the risotto is creamy and the rice is al dente remove from heat and stir in the Parmesan, bacon and zest. I was having a slightly embarrassing craving for the cheesy rice with broccoli I probably had once as a child and which was probably a boil-in-a-bag concoction, and thought I'd take the grown-up route and make risotto instead. It was very creamy and hit the spot the way the original was but was suitable to serve for a whole meal. Note: I made extra bacon one day for breakfast so I didn't have to fuss with making the bacon before making the risotto. It really saved time on a weeknight! 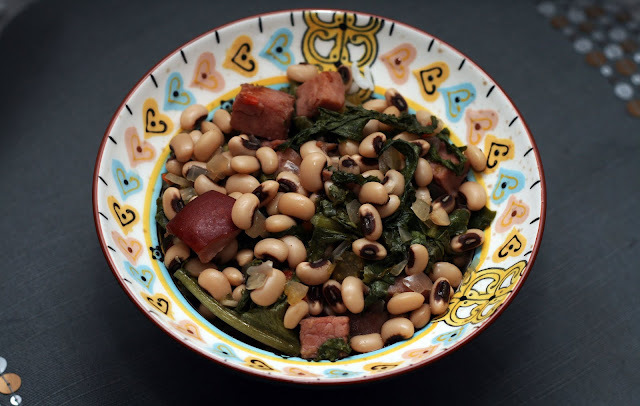 The night before you want to serve the dish, place the black-eyed peas in a 4 quart slow cooker. Fill it with water. Cover and allow to sit overnight. Drain, return the black-eyed peas to the pot and add the spices, ham, Worcestershire sauce, vinegar, onion, peppers, garlic, and celery. Stir. Cook on low 8-10 hrs. One hour before you would like to serve, stir in the escarole. It might look like it won't fit in the slow cooker but a few stirs should be enough to incorporate it. Cover and continue to cook*. Serve as-is or over cooked white rice. *If you are pressed on time at night, you can add the escarole in the morning but it will be quite soft by dinnertime. Tip: If you have time in the morning, lightly brown the ham on all sides to bring out the flavor before adding it to the slow cooker. This recipe is a good luck powerhouse! Black-eyed peas are frequently served on New Year's Day because they swell (or look like coins, depending on your source) when cooked symbolized growth and prosperity in the coming year. Cabbage or collards is frequently served as well as it symbolizes paper money. I swapped another leafy green, escarole, for the cabbage but the sentiment is the same. The last bit of luck comes from the ham which is said to be lucky because pigs are portly, symbolizing prosperity and they "root forward" symbolizing progress. I made this recipe so it is a bit soupy, perfect for serving over rice or mopping up with crusty bread. 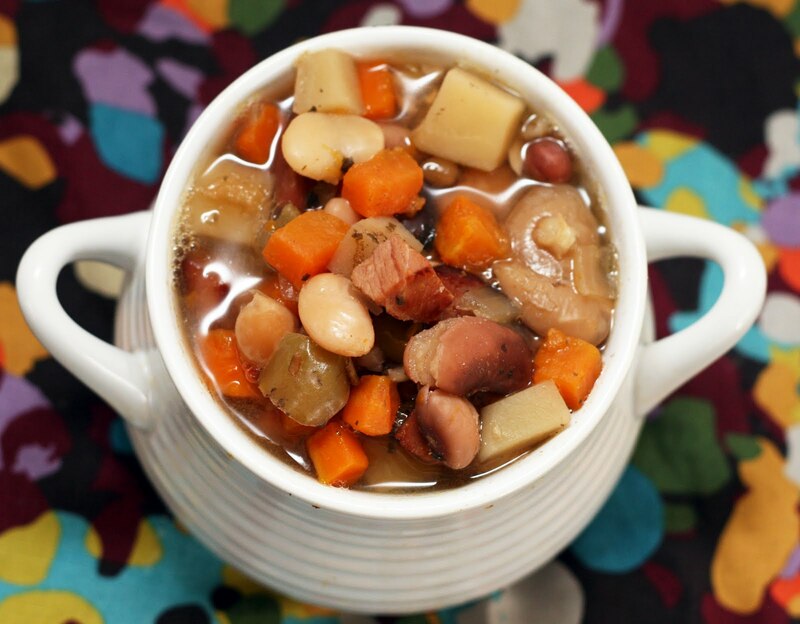 The night before you want to eat the soup, place the beans in a 6-quart slow cooker. 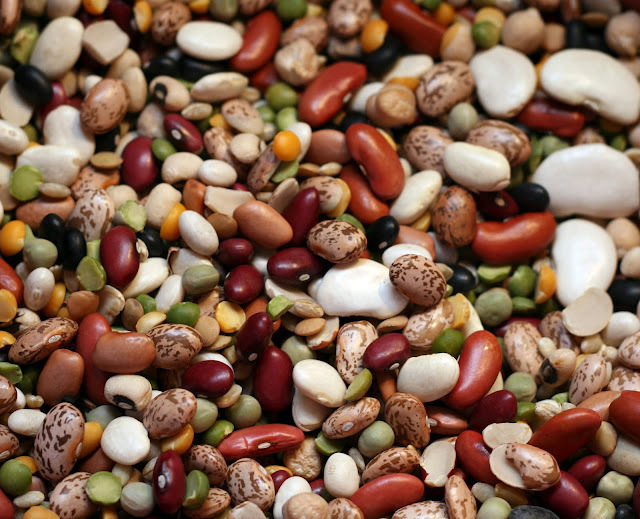 Fill the slow cooker insert with water, covering the beans by at least 2 inches. I normally fill the insert nearly to the top. Cover and allow the beans to soak overnight (with the slow cooker turned off). Add the vegetables, ham, spices and stock. Cook on low for 8-10 hours. Stir and serve. Variation: If I'm home, I like to brown the ham and add half at the beginning and half about halfway through the cooking time. I think that yields a slightly hammier finished product but both are good. This is a great way to use up leftover ham. I had one of those spiral sliced hams and it never seems like the spiral extends down far enough and there is always a lot of perfectly good, lean ham down near the bottom. I've taken to hacking it off and tucking it away for when I need cubed ham and serving the slices for dinner and sandwiches. So much better than just tossing it like I've seen hostesses do. It was a hickory smoked ham so added great flavor to this rich, comforting soup. Place the beets, apple and onion in a medium bowl. Whisk together the dressing ingredients. Drizzle over the beets. Stir to evenly distribute. Note: To save time boil or roast the beets the day before and refrigerate the beets overnight. I love beet salads. I know some people are beet-phobic but I don't know why! Beets are sweet but not overly so, they are good for you and they dye everything they touch pink. Win-win-win, in my book. I especially like beet salad and it seems like nearly every European cuisine I research has some version of a beet salad. You might remember the Polish beet salad I made this year for Thanksgiving. While I was at Lucia Fest at the American Swedish Historical Museum in Philadelphia last year, I had these beet salad and within the week, I recreated it at home. The secret ingredient is the horseradish. It is nose clearing and adds quite a kick to a salad that otherwise could be sweet. I've seen versions that call for mustard instead of horseradish (if you do that, spring for the good, Swedish stuff) but the version I had definitely had horseradish. The apple provide a welcome and some times unexpected (it is difficult to tell the beet from the apple under the dressing) crunch. 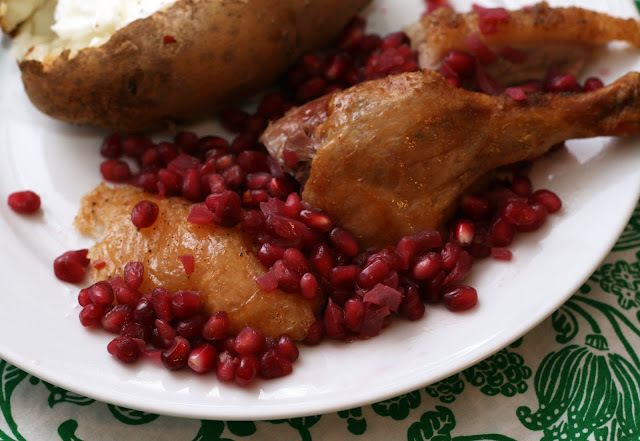 The perfect light(ish) side dish for the holidays and a fixture on the julbord. One fun note: I've seen pictures of this salad on open-faced leftover meatball sandwiches (köttbullar smörgås). Yum! Preheat oven to 325. Whisk together the rub the dry rub into the skin of the duck. Refrigerate 1 to 2 hours. Reduce heat to 325. Place the duck on a roasting rack on a roasting pan and roast for 2 hours or until cooked though. Heat the oil or fat in a saucepan and saute the onions and red pepper flakes until the onions are translucent. Add the stock and 2 cups the pomegranate arils. Reduce the heat and simmer until the sauce thickens. Stir in the remaining arils. Drizzle over roasted duck. This is a really simple yet festive dish. Perfect for a small holiday gathering. Spray with baking spray a 9x13 pan. Arrange bread slices in a single layer in the pan. Set aside. Whisk together eggs, milk, eggnog, vanilla paste, rum and spices until well combined. Pour mixture over bread. Turn bread slices to coat. Sprinkle with cranberries. Cover lightly with foil and refrigerate overnight (about 8 hours). Preheat oven to 400. Bake 10 minutes. Turn bread over and continue baking until just golden, around 5 minutes. Serve immediately. I have to admit, I'm not the biggest French toast fan. I like it stuffed, generally, but plain French toast normally doesn't appeal to me. This French toast however, is amazing! The bread gets almost custardy from the long soak in the eggnog mixture but it still gets nice and brown (and crispy!) during the baking process. This is my new go-to fancy breakfast for busy mornings. Or I could start the soak in the morning and have breakfast for dinner! Sorry about the Instagram-like nature of the picture, we are experiencing a bit of a lighting crisis here in the Rappaport kitchen and it has been horribly dark out. Prep jars/lids for canning. Add the pomelo segments and zest into a large, heavy bottomed pan. Add the sugar. Bring to a boil, stirring carefully to avoid splashing, break up the segments, occasionally. Boil until it begins to reduce and thicken. 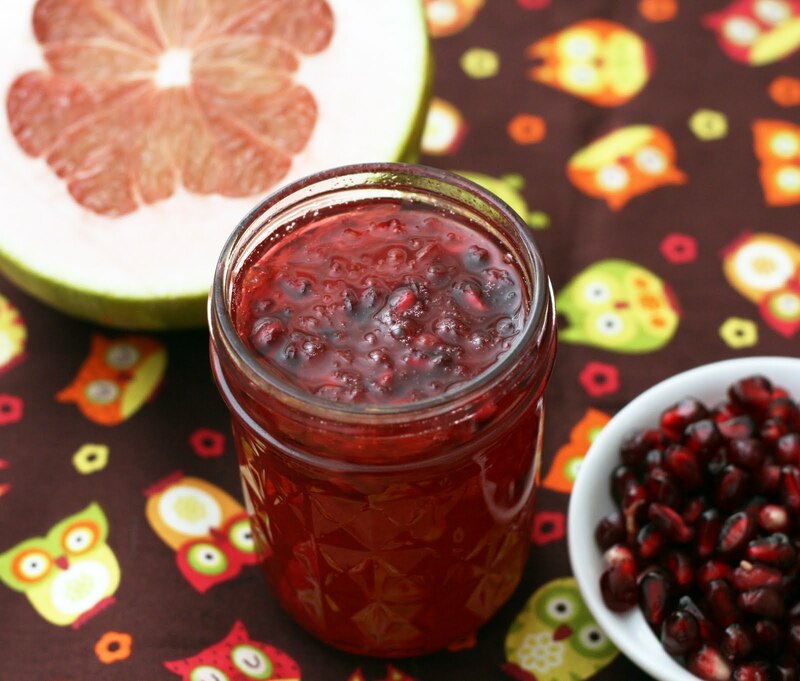 Stir in the pectin and pomegranate. Continue cooking at a low (rolling) boil for 5-10 minutes or until it looks thick and jammy. Fill the jars leaving 1/4 inch headroom. Process in the hot water bath for 10 minutes. When I found myself in possession of a bunch of lovely pomelos and 14 cups (yes, you read that correctly, 14 cups) of pomegranate arils, I really wanted to make something using the two together. I had a hunch that pomelo's tart citrus would complement the sweet juiciness of the pomegranate. Pomelos are normally greenish yellow inside so I was surprised when I cut into them and they were bright pink! This only confirmed that I had to bring pomelo and pomegranate together. Pomelo segments easily supreme and naturally break into smaller pieces which is perfect for jam making. They also have a ton of pith and a thin skin but since we are making jam and not marmalade, that isn't much of an issue; there is just a lot of flesh to cut off to get to the fruit. I prepped the pomelo the night before (the pomegranate had long been processed, the arils can keep for a month in the fridge) so the next day, I just had to pop in the pot. This made jam making a much less daunting task in the morning! From cooking to jars cooling, it only took about 40 minutes. Most of the pomegranate arils held their shape and like they do in most dishes, they explode when you bite into them, which is slightly unexpected in jam, but very fun. The few that did burst, helped turn the the jam a lovely deep pink. So, go check out your local store and pick up some pomelos (aka pummelo or pommelo, this huge fruit tastes like a sweet grapefruit and was one of the first citrus fruits)and pomegranates while they are in season. Preheat oven to 350. 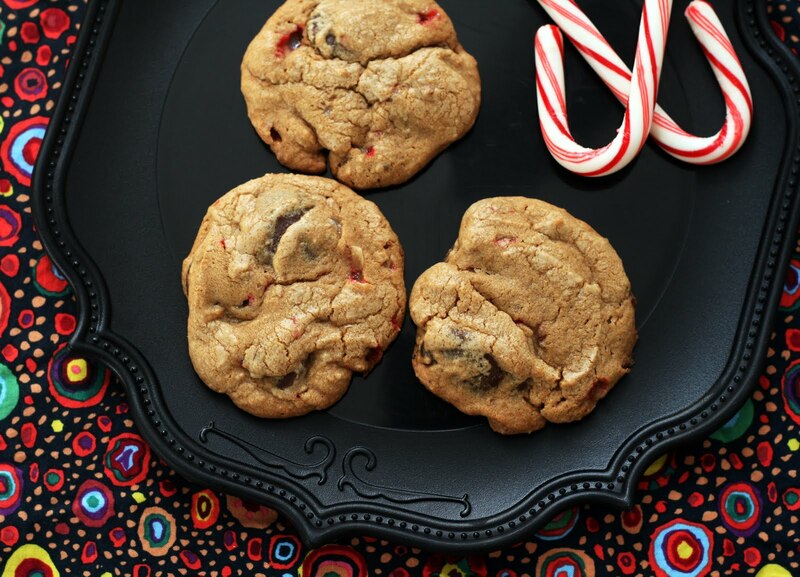 Line 3 cookie sheets with parchment paper. Whisk together the flour, salt, and baking powder in a medium bowl. Set aside. In a large bowl, cream the butter and sugar until light and fluffy. Add the egg and vanilla and combine thoroughly. Gradually add the dry ingredients to the butter mixture and mix until a very thick dough forms. Fold in the melts and candy cane bits. Form cookies by dropping 1 teaspoon of dough on the sheet two inches apart. Flatten slightly then bake until light brown, about 12 minutes. Let cool on wire racks. Tip: I leave the candy canes in their plastic wrapper and whack them with a rolling pin to create the bits. Then I "unwrap" them into a bowl or measuring cup. My mom brought me back these Hershey Baking Melts from Chocolate World at Hershey Park and then next thing you know, I found them at the regular supermarket! If you can't find them, I think some dark chocolate disks could be a good substitute. The best part of these cookies is the large chunks of chocolate so while chips would work, something with some heft is better. I really enjoyed the flavor, texture and melty-ness of the "melts" but I will say their size and flattish shape made them tricky to scoop with my cookie scoop and I ended up with rather large cookies. Which is fine with me, but the total yield wasn't as many as I could of eked out using regular chocolate chips. But! You do get a big shot of gooey chocolate in every bite so I think it is worth the minor hassle. I've been candy cane crazy this year so I stirred some into the dough which added a jolt of peppermint that was delicious and refreshing but not overwhelmingly "PEPPERMINT", just a lovely holiday note in an otherwise pretty straightforward cookie. I don't want to give the impression that straightforward is a bad thing. It isn't at all. 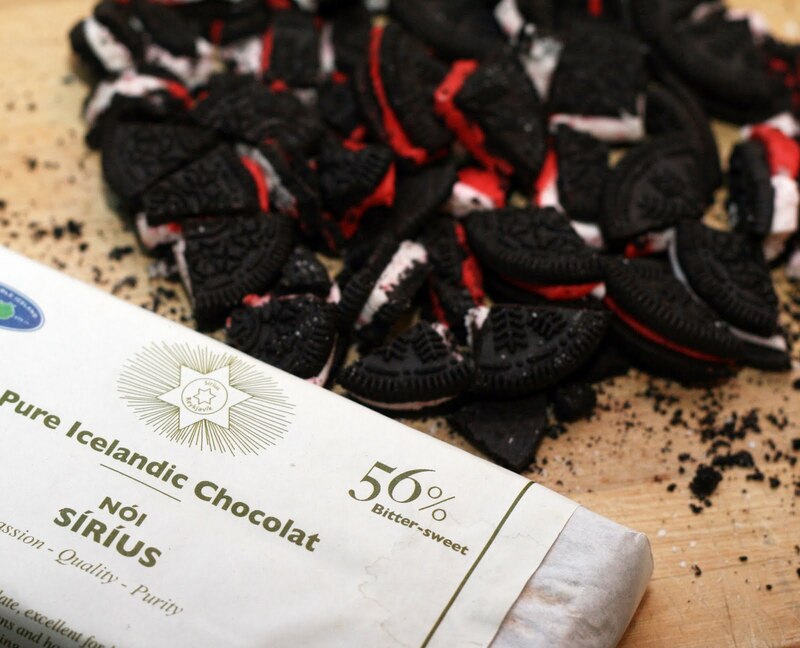 These are very, very good cookies. We ate nearly all of them in about three days. In a large cast iron skillet or other heavy bottomed pan, heat about 1/4 inch oil. 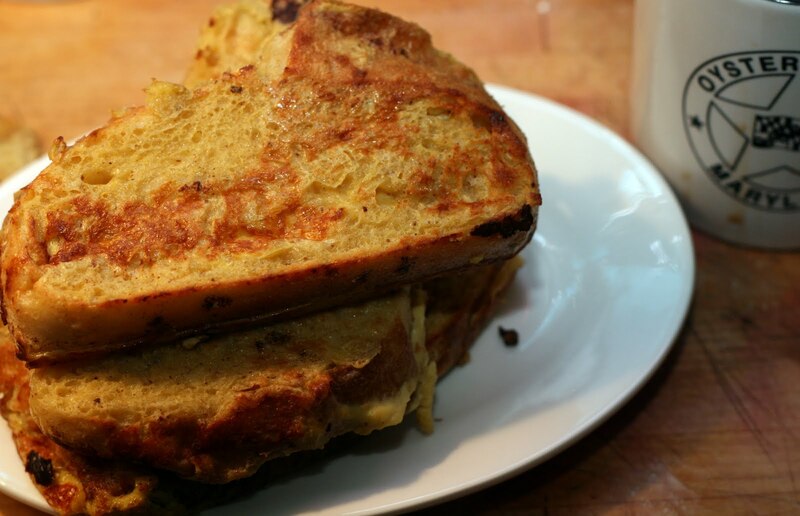 In a large bowl, combine the eggs, spices, horseradish and the matzo meal. Add potato, rutabaga and onion. Toss to combine. Form into flat patties. Fry in hot oil, flipping half way through, until just golden. Drain on paper towel lined plates. 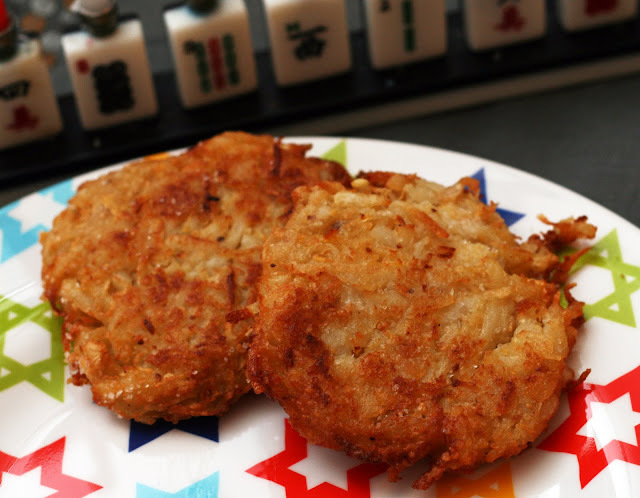 Yield: about a dozen latkes, depending on size. You have to love a holiday that encourages the making and eating of fried foods. So yesterday we lit the candles, turned on the stove and fried up some latkes. The last few Hanukkahs I've pulled out the mandolin to shred the potatoes but this year I went old school and used the box grater. It really works well. If your potatoes weep a lot, drain them and pat them dry before frying. Rutabaga naturally shreds finely and was easy to evenly distribute in the potato mixture. It also adds a bit of crunch and a peppery taste. I love horseradish so I threw some of that in too. It gave some zip without being overpowering. We enjoyed them with sour cream. Roll the dough into 1 inch balls. Place on the cookie sheets spacing each cookie 2 inches apart. Bake 10-12 minutes or until slightly browned and “set” in the middle. Remove to a wire rack and cool completely. Line a platter or cookie sheet with waxed paper. Whisk together cocoa and confectioners’ sugar in a shallow bowl. Place the cookies in a food processor and pulse them until they are fine crumbs. Pour the crumbs into a medium bowl and stir in the peanut butter. Mix until a uniform texture is reached. Roll the mixture into 1 inch balls. 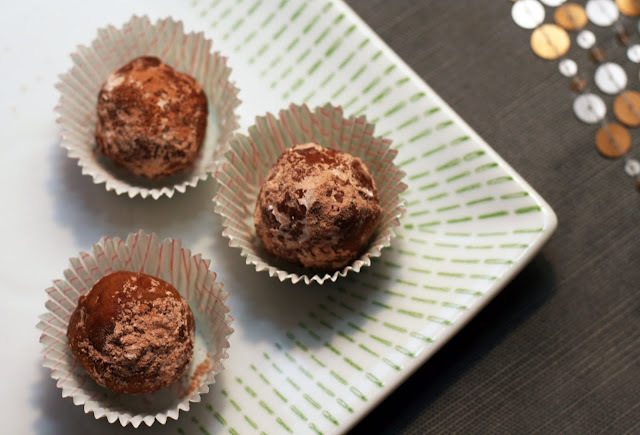 Roll each ball in the cocoa and sugar mixture. Place on waxed paper lined platter and refrigerate 1 hour prior to serving. Pillsbury asked a few bloggers to come up with some quick and easy recipes using their refrigerated dough. Normally I make my cookies from scratch but I can't resist a challenge and I think we've all been in the situation where we need some last minute cookies. Well, during December, any way! 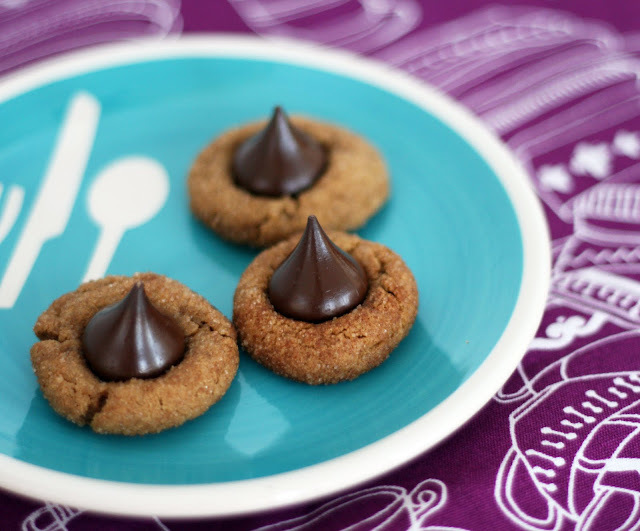 These cookies are sort of like a cross between a cookie and a truffle. Crunchy and creamy at the same time they are the perfect treat for peanut butter lovers. If you want to get extra fancy, you could dip them in chocolate but I enjoyed the flavor and ease of rolling them in cocoa. 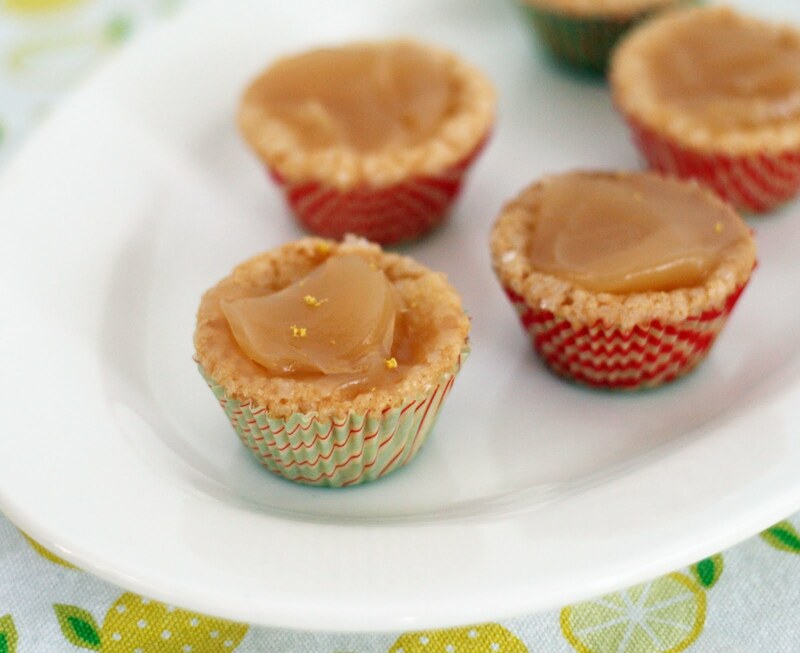 Arrange the paper cups on a baking sheet or platter. Set aside. Whisk together the sugar, syrup, butter and cream in a heavy bottomed 2 quart saucepan. Cook over low heat, stirring occasionally, until the mixture forms a firm "hard" ball when dropped into a glass of very cold water. 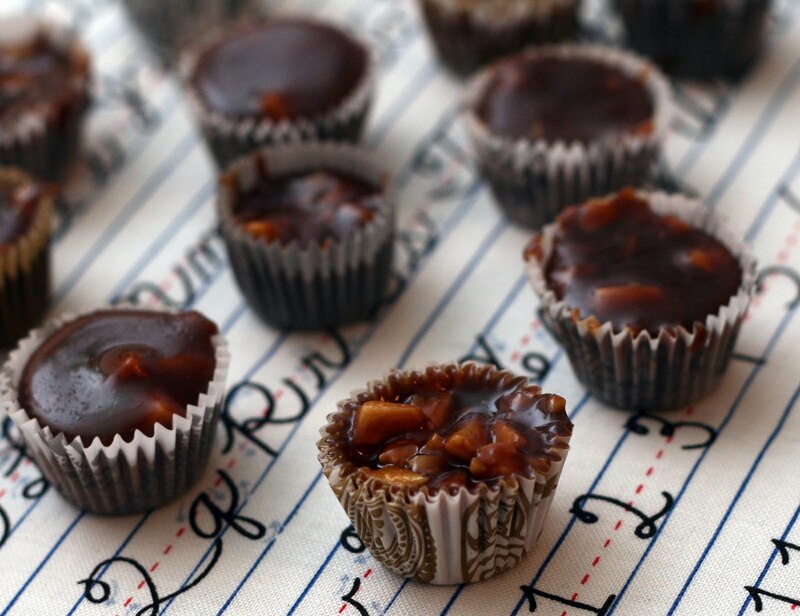 Stir in nuts and divide quickly into very small paper candy cups. *Swedish light syrup. I buy it at Ikea or stores that sell European and/or Scandinavian ingredients. Golden syrup is an acceptable substitute. Knäck translates into "crack" which makes sense because this thick toffee is quite crisp and cracks when you bite into it. It has a almost burnt sugar flavor to it thanks to the syrup and the almonds provide a delicious, nutty crunch. It is the perfect addition to a holiday dessert table. The candy is easy to make and in small batches like this one (you can double this recipe successfully) it cooks up very quickly. The most difficult part is pouring the mixture into the cups. They are quite small and easily tip over. The liquid is also very, very hot yet cools rapidly so one has to work very quickly to fill the cups before the mixture cools and hardens. I transferred my molten mixture into a large, glass measuring cup with a lip for easy pouring. Take care, you don't want to burn yourself for the sake of candy! Note: The candy should be made in tiny waxed paper cups. I find mine at Ikea during the wintertime but I've seen similar sized cups at candy supply shops. Any store that sells Swedish cooking and baking items should have them in stock as well. They are about 1/2 the size of a mini muffin liner. Preheat oven to 350. Spray loaf pan with baking spray. Whisk together the dry ingredients in a medium bowl. Set aside. In a large bowl, mix together the eggs, vanilla paste, oil, zest sugar and molasses until well combined. In a small bowl, whisk together the buttermilk and rum. Beat in the dry mixture alternately with the buttermilk mixture, mixing well with each addition. Pour into prepared pan. Bake 45-55 minute or until a toothpick inserted in the middle comes out with just a few moist crumbs. Cool in pan 5 minutes then invert into a wire rack to cool completely. Dust with confectioners sugar if desired. Last year I received this neat gingerbread loaf pan but didn't get a chance to use it before the holidays and well, making gingerbread outside of December seems a little wrong. It was worth the wait! I'm always a little nervous using shaped pans, especially for a moist bread like this but it came out beautifully. A loaf is the perfect size for us as well, a whole cake is a little daunting but this bread is just right. The bread is very fragrant and has just the right amount of spice. 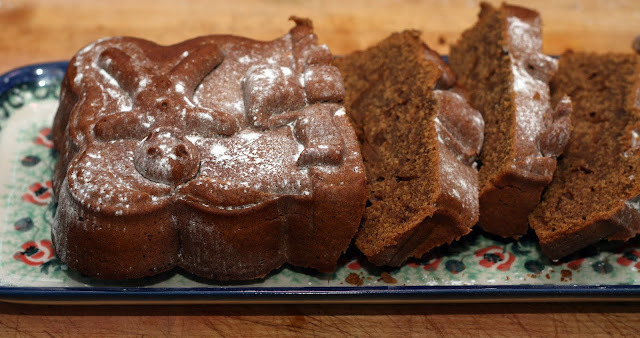 I love adding a bit of citrus zest to my gingerbread. I think it perks the flavor up a bit and to me, tangerines just smell like winter holidays. It reminds me of when it would be an immense treat to receive a tangerine or orange in your stocking because they were such a luxury. Place the breadcrumbs and milk (cream) in a medium bowl. Allow to soak 5 minutes. Add the remaining ingredients and mix until well combined. Form into very small (walnut-sized) meatballs. Heat some oil in a oven safe pan (I used a cast-iron skillet). Add the meatballs and saute until browned on all sides. Place the pan in the oven and bake for 10-20 minutes or until the meatballs are fully cooked. Serve immediately. *Or you can use a mix of just beef and pork. I had all three so that is what I used. I found that Swedish cookbooks often suggest a mix of beef and elk(!) but that's a little difficult to find here. Last year we went to Lucia Fest at the American Swedish Historical Museum in Philadelphia and it re-sparked my interest in making Swedish foods at home. We don't have much in the way of Swedish cuisine here in Baltimore beyond Ikea but whenever I am in NYC, I always visit Swedish restaurants and even better, Sockerbit, the Swedish candy store. I love it but it is much more affordable to make the food at home. I had read up on (and made a couple!) traditional Christmas foods last year but it was a little too late to share most of the recipes. This year I tracked down some julmust (Swedish Christmas soda) to fortify myself and went about creating some recipes for these Swedish treats. Perhaps the easiest and most "friendly" recipe are these meatballs. 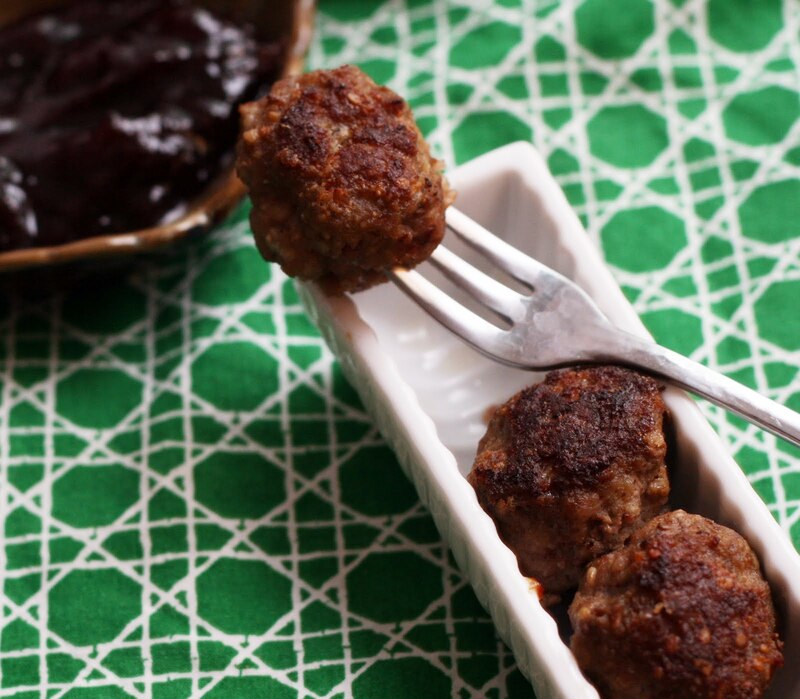 Very similar to köttbullar, the more everyday Swedish meatballs, these are heavily spiked with allspice and are found on the julbord, the Christmas smörgåsbord. Or if you are not up to hosting a full julbord, served with some potatoes, gravy and lingonberry preserves for lunch or dinner. They are so good and simple to make. Some recipes call for just pan frying the meatballs but I think they get crisper and cook more evenly with the method I shared here. I'm hoping to tackle some more Swedish dishes this season so look for them later this month. In the meantime, check out pepparkakor, a tasty cookie for Christmas and Ärtsoppa (Swedish Yellow Pea Soup) and Kåldolmar (Swedish Stuffed Cabbage) which aren't Christmas recipes per se, but very tasty! Preheat oven to 350. Spray with baking spray or grease and flour one 8x8 inch baking pan. In a saucepan, melt the butter, cocoa and chocolate together over low heat. Stir occasionally, and when the chocolate is nearly melted, remove from heat. Whisk until smooth. Set aside. In a small bowl, stir together flour, salt, baking powder. In a separate bowl, beat together the brown sugar, sugar, eggs and vanilla until smooth. Slowly stream the chocolate mixture into the eggs and mix to combine. Gradually stir in the dry ingredients and mix until the batter is thick and glossy. 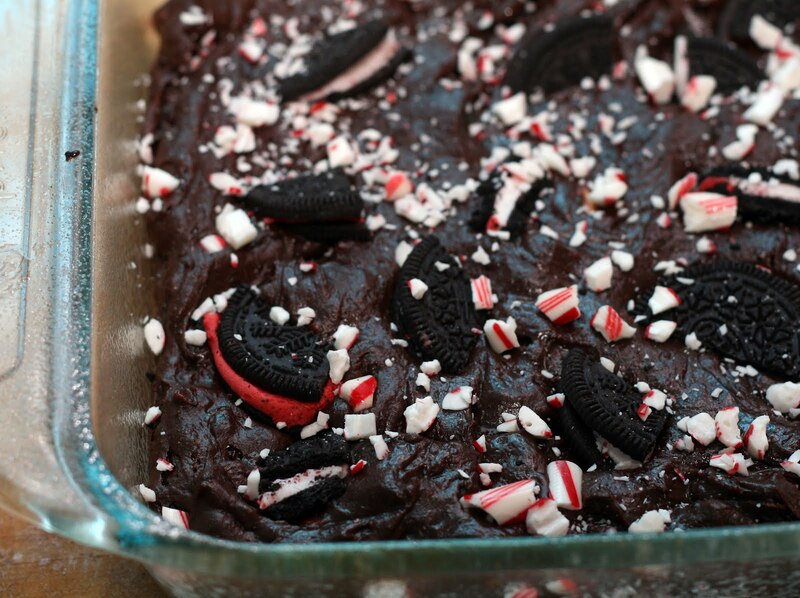 Stir in most of the Oreos and half of the candy cane chunks. Pour into prepared pan and sprinkle with remaining candy cane bits and Oreos. Bake 30 minutes or until a toothpick inserted into the center comes out clean or with one or two crumbs. I saw Candy Cane Oreos at the store and couldn't resist picking up a box. I don't normally buy cookies but I will admit to a fondness for holiday Oreos, they are always so fresh tasting and I like the seasonal designs. Unfortunately when I opened this box they were all messed up looking! For a lot of the cookies the Oreo and holiday design side was facing in towards the cream filling so the outside was odd and flat. Some of the cookies only had half of the usual filling, some had extra cookie bits protruding from the side of the cream filling (despite there being no broken cookies in the box) and still more had oddly uneven amounts of filling-half of the cookie would look normal and the other half was nearly flat. That's no fun! They tasted perfectly fine so I didn't want to toss them but they were not a cute as I was hoping. So I decided to make something with them rather than eating them plain. 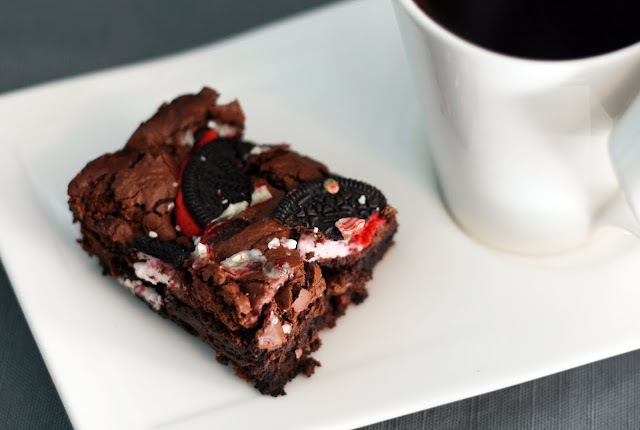 Most of the recipes for Oreo brownies I've seen call for a box mix but well, I'm already cooking with a store-bought cookie so why would I want to use a mix for the brownie part too? I know some people swear that brownie mix is even better than homemade (gasp) but I don't think you can beat a homemade brownie made with luscious dark chocolate. You do have to melt that chocolate but it is easy, I swear and makes for better, richer brownies than you could hope for from a mix or from using cocoa alone. I stirred in some candy canes to up the mint flavor and tie in the candy cane flavor of the Oreos and let me tell you, I have never smelled batter that was that mint-chocolate-y before. Yum. The brownies themselves are intensely chocolate with hints of mint and a fudgey but not too fudgey (or worse, dense), creamy texture.